Maui tandem bike rental, the Electra Hellbetty at West Maui Cycles in Lahaina. Cruiser Bike Rides in Lahaina Town – What could be more fun than cruising Front Street on a Red Electra Hellbetty tandem with your favorite honey? After you pick up an Electra tandem bike rental at West Maui Cycles in Lahaina, head south from the bike shop and take the next right as you ride toward the ocean to Front Street where you'll start exploring Lahaina by bike. If you didn't have breakfast yet, begin with a hearty breakfast at Longhi’s on Front Street in Lahaina. After taking in a few carbs you’ll be ready to ride to all the historic sites around Lahaina. Our professional bike mechanics and friendly staff at West Maui Cycles will help with directions and information about where to ride or how to get to the older historic sites in Lahaina. Stop at the south end of Front Street for a burger lunch at Cool Cats. When you need a light break on your Lahaina bike ride, cool off with Hawaiian shave ice. After your bike riding in Lahaina, grab a delicious dinner at the Lahaina Grill or dance the night away at Fleetwood’s on Front Street. If you don’t want to ride a tandem in Lahaina, take out a pair of cruiser bike rentals! 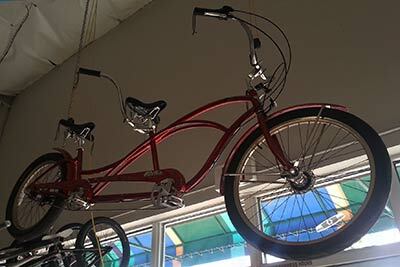 West Maui Cycles is the only authorized Electra Bicycle dealer on Maui and we know you'll love the comfortable riding position provided by these fun retro styled Electra cruiser bike rentals. Along with the lock and bike helmet, a handlebar basket is included with our cruiser bike rentals. Electra bike rentals are available for men and women. A West Maui bike ride to the Olowalu petroglph from Lahaina. Lahaina to the Olowalu Petroglyph Bike Ride – With several miles of flat road bike riding along the coastline before you get to the Olowalu petroglyph, be sure to leave time to explore the beaches along the ride and don’t forget your swimsuit or towel! Since the single track bike trail to the petroglyph can get dusty and hot, you’ll want to stop at one of the many swimming beaches along the Lahaina to Olowalu bike route. Take plenty of hydration and sunblock, too. Leado’s Kitchen and Pie Shop is a great place to get a sandwich for a picnic before the trail ride to the petroglyph at Olowalu. Or, at least stop to treat yourself to a homemade pie after exploring the petroglyph and before heading back on the ride to Lahaina. Read more about the Lahaina to Olowalu Petroglyph bike ride and get the bike map coordinates to store in your mobile phone for use during a cycling vacation on Maui. Cannondale performance road bike rental tandem at West Maui Cycles in Lahaina. South Maui Bike Ride from Wailea Resort to Le Perouse – Ever wondered what it would be like to ride a bike on mars? You’ll feel like you are on another planet on this South Maui bike ride! Head south out of Wailea resort. Soon after you pass Makena you’ll enter a barren lava field reminiscent of the moon. Stretching down southern flanks of Haleakala and eventually the spilling into the ocean, this is one of the most recent lava flows left from Haleakala. The road is a little rough but worth the ride before eventually reaching Le Perouse Bay at the southern end of the bike ride. Before heading back towards Kihei, keep your eyes out for pods of dolphin frequently seen in the waters around Le Perouse Bay. Though this bike ride in South Maui could be accomplished on just about any type of rental bicycle, dependent on where you begin the ride along with your fitness condition you’ll probably enjoy this bike ride more on a hybrid bike rental instead of a cruiser bike. If your Maui rental accommodations are at one of the northernmost resorts in Kihei or at Maalaea harbor, you’ll be happiest if you rent a performance road bike for the Le Perouse bike ride. Our Cannondale tandem road bike would be fun for couples riding to Le Perouse, too. For a romantic lunch on Valentines day, stop at oceanfront restaurant Sorentos on the Beach. Or, treat your sweety to a surprise lobster lunch at the 5 Palms Grill during your Valentine's day Maui bike ride! Both restaurants are on the edge of Wailea and Kihei with beach views. Early riders may extend the south Maui bike ride by heading north and further into Kihei for lunch at one of the numerous restaurants along Kihei Road. Buzz’s Wharf is among several restaurants at Maalaea Harbor making for a good midway resting point on a bike ride from South Maui to Lahaina in West Maui. West Maui bike ride from Kapalua to Kahana and into Kaanapali resort. Explore Kapalua Resort on a Bicycle – You’ll probably appreciate being able to shift into lower gears on a crosstrail bike or using a performance road bike rental to get up and down the hills found in the Northern most resort in West Maui at the Kapalua Resort. Kapalua resort is home to the XTerra World Championship but you don't have to be an XTerra mountain bike rider to enjoy cycling at Kapalua! You'll have a blast riding a Cannondale Quick CX4 hybrid bike rental through towering Cook Pines gracing the roads with spectacular ocean scenery unfolding around every corner of this West Maui bike ride. For a romantic fun bike ride on Valentine day, stop for lunch at the Pineapple Grill in Kapalua. Or, top off a day of bike riding in West Maui with a short ride up the hill to the Plantation Golf Course to indulge in a romantic dinner with amazing sunset views at The Plantation House restaurant. If you are up early, begin your bike ride in Kahana at the Gazebo Maui restaurant. During the winter months when annual humpback whales migrate, you’ll be able to store some carbs for the day of bike riding with delicious banana mac nut pancakes breakfast while watching the whales frolic! Then hop on your bike and work off some of those calories riding a bike in Kapalua. Stop at the Honolua Store for lunch or at the Banyon Tree restaurant in the Ritz Carlton Kapalua Resort hotel. More lunch options are available if you ride a little further out of Kapalua and head south into Napili. Stay on the lower road and you’ll be able to ride all the way from Kapalua to Kaanapali without getting on the highway.